David William Greenhouse, 61, Beloved husband, father, grandfather, brother, uncle and friend, was born in Miami, Florida to Dr. Maxwell N. Greenhouse and Betsy Jane Greenhouse on November 19, 1956. 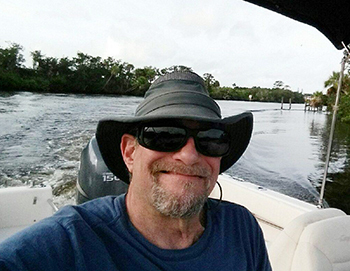 As a young boy growing up in the Morningside neighborhood on Biscayne Bay, Dave developed a love for the sea. He and his cousin spent a lot of time swimming to and from and exploring the nearby barrier islands. As a teenager, Dave's adventurous spirit could not be contained. After seeing an advertisement in National Geographic with the headline "Go to School on the High Seas," David responded and soon found himself beginning high school aboard the Te Vega, a schooner that sailed the world. Aboard Te Vega, David began to hone his nautical skills, including navigation, seamanship, and the art of nautical knot tying. Upon returning to Miami, Dave took a job at the Miami Seaquarium, working with dolphins and earning the nickname "Dolphin Dave." In 1975, David enlisted with the US Navy as a deck seaman, then struck for his rate as a quartermaster, advancing to the rank of petty officer second class. After serving for four years, he began working at his beloved cousin Clifford Lawton Suchman's real estate company. During his time working in real estate, David executed deals, managed several properties, and was off to a successful career. In 1984, through mutual acquaintances, David met the love of his life, Dorothy Clark. Over the course of 34 years, those who knew Dave, knew Dottie. The love shared by "Dave and Dottie" and their devotion to one another is a storybook romance. David's real estate career was flourishing, but his love for the ocean was too strong. In 1990, after getting Coast Guard and his love Dottie's approval, David joined the Merchant Marine, beginning as Third Mate and working his way up to Chief Mate. He sailed as Chief Mate on military and commercial vessels, including tankers and cargo ships. He traveled hundreds of thousands of nautical miles, arriving in some of the world's busiest ports. He helped provide military supplies during the Gulf War crisis, specifically Operation Desert Storm. After 8 long years of deployments, he longed to spend more time with his loving family. In 1998 he started working as an adjunct instructor at STAR Center, a division of the Safety & Education Plan of American Maritime Officers (AMO). This new position allowed him to stay closer to home. In 2001 he was promoted to Deck Upgrade instructor, teaching United States Coast Guard required courses. He was a dedicated maritime professional, devoted to his career. He worked tirelessly as the heart and soul of the Upgrade program, assisting thousands of AMO members in obtaining their USCG unlimited Chief Mate and Master licenses. Dave retired in 2015. After his retirement, Dave and Dottie moved to Port Saint Lucie where he was able to continue his nautical adventures daily. Dave was a true seaman and steward of the sea, as well as a lifelong member of the Jacques Cousteau Society. In addition to his love for the sea, Dave was a philosopher, a seeker of knowledge, and as many have put it - a spiritual warrior. As a longtime member of Alcoholics Anonymous, David shared the message of recovery to many people, including those who were incarcerated. He often opened his home to those in need of refuge. Dave was also a devotee of Paramahamsa Prajnanananda, the spiritual leader of the Kriya Yoga Institute in Homestead, Florida. Along his journey, David imparted much wisdom and knowledge to friends, family and even strangers. To know Dave is to love him, and if you were lucky enough to have had a conversation with him, then you can count yourself amongst those in the special club we affectionately call "Touched by Dave." Although his earthly presence is dearly missed, David's love and light will live on for eternity. He is survived by wife, Dorothy, sister, Susie, his children Cindy and her husband Mike del Marmol, Regina and her husband John R. Bailey, and Lori Horne; grandchildren Ryan Fried, Kelly McDaniel and Jessie Ray del Marmol, Kathryn Telsede; niece Lily Sparks and her son Jackson L. Pierce, niece Laura Sparks and her sons Brady J. Frasor and Brendon M. Frasor, nephew Daniel Sparks and his wife Stephanie Sparks, their daughter Ella Rose Sparks; and cousins Elizabeth, Larry, Steve, Dan & Pam Suchman; and God Daughter Chelsea Rose Gorman along with other family members and dear friends and of course his beloved cats of fifteen years, Bhodi and Layla. In memory of David William Greenhouse please consider making a donation to www.oceancleanup.com, an unprecedented expedition to remove 50% of the great pacific garbage patch in just 5 years - track their progress at www.theoceancleanup.com/system001/.